The aim of the study was to assess how deep into the acinar region the airway response to cold dry-air hyperventilation challenge (CACh) reaches in subjects with asthma of different severity. Peripheral airway function was measured using a single-breath sulphur hexafluoride (SF6) and helium (He) washout test and overall airway function by forced expiratory volume in one second (FEV1) at rest, after CACh and β2-therapy in 55 adults with a history of asthma. The normalised phase-III slopes (SnIII) for SF6 and He were used to assess peripheral airway obstruction and the (SF6-He) SnIII difference to indicate where obstruction occurred. While a greater He versus SF6 slope increase indicates a response close to the acinar entrance, the reverse indicates a response deeper into the acinar airspaces. Twelve subjects had a major fall in FEV1 (≥20%) after CACh, 16 a minor fall (10–19%), and 27 did not react. Resting He and SF6 SnIII were significantly greater in major responders with respect to minor and nonresponders, while resting FEV1 did not differ between the three groups. The major responders showed marked increases of He and SF6 SnIII after CACh, with greater increase for He resulting in a negative (SF6-He) SnIII difference. To conclude, airways close to the acinar entrance participate in the overall airway response to cold-air challenge in asthmatic adults with marked airway hyperresponsiveness to cold, dry air. This study was supported by the Research and Development Council, Central Hospital, Skövde, Sweden. There is growing awareness that the inflammatory cell infiltration and airway wall thickening characteristic of bronchial asthma engage not only the large and the medium-sized airways but the entire airway tree 1–3. The peripheral airways are usually defined as those airways with a diameter of <2 mm and correspond approximately to airway generations 8–23 of Weibel's 4 model of lung architecture. Direct and indirect evidence of peripheral airway involvement in asthma have come from post mortem studies 5–6, tissue specimens obtained in vivo using bronchoscopic biopsy techniques 7, bronchoscopic airflow resistance studies in distal lung units 8–10, and inert-gas washout studies 11–13. In a previous nitrogen (N2) multiple-breath washout (MBW) study, Stromberg and Gustafsson 13 assessed the peripheral airway effects of cold dry-air hyperventilation challenge (CACh) on asthma patients and controls 13. After the challenge the asthmatic subjects demonstrated not only a fall in FEV1 but also increased overall ventilation inhomogeneity and gas trapping, indicating peripheral airway obstruction 14. Exercise-induced bronchoconstriction (EIB) is a common problem in children and adults with asthma 15. The underlying mechanism of EIB is drying and cooling of the airways due to the increased ventilation necessary during physical exercise 17. Evaporation of water from the thinairway surface liquid layer is thought to result in a hyperosmolar stimulus to inflammatory cells in the airway mucosa of asthmatic subjects and the subsequent production and release of substances mediating airway smooth contraction and airway wall oedema 17. Airway challenge by isocapnic dry air or dry cold-air hyperventilation has therefore been used to diagnose EIB and asthma 19, and a positive response to such a challenge may serve as indirect evidence of ongoing airway inflammation and of airway hyperresponsiveness (AHR) to the mediator substances released. The findings in the previous CACh N2 MBW study 13 indicated a peripheral airway response but the study could not tell whether the intra-acinar airways were involved. Intra-acinar airways can be assessed by the use of a more sophisticated N2 phase-III slope analysis of the N2 MBW 11 or by a single-breath washout (SBW) with test gases of different diffusivity, such as helium (He) and sulphur hexafluoride (SF6) 20. In the present study, a He/SF6 SBW test was used to extend the previous observations on peripheral airway dysfunction in asthma 11–13 in an attempt to assess how deep into the acinar region the airways response to CACh reaches. CACh was performed in all 55 adult subjects participating in a long-term prospective follow-up study of childhood asthma 22. At a previous follow-up visit 23, performed 5 yrs earlier, 24 out of 53 subjects tested showed pathological bronchial hyperresponsiveness (BHR) to CACh, and 11 of these 24 subjects had a fall in forced expiratory volume in one second (FEV1) of ≥20%. A similar variation in BHR in the cohort at the present follow-up was expected. Such a wide range in BHR to CACh in the study group would provide a unique opportunity to assess the degree of peripheral airway engagement in subjects with different asthma severity. The SBW phase-III slope of an inert tracer gas has beenused since the early 1970s 25 as a marker of small airway dysfunction 14. Unfortunately, the classical SBW manoeuvre involved inspiration of the test gases over a vital capacity (VC) manoeuvre, and microgravity experiments performed in the meantime have confirmed that the phase-III slope resulting from the classical SBW test is in fact a mixture of small- and large-scale ventilation inhomogeneities, partly dependent on gravity and airway closure 26. By contrast, a modified SBW test starting the inspiration from functional residual capacity (FRC) has been shown to be less affected by confounding effects, such as gravity 28. Two different mechanisms have been shown to contribute to the phase-III slope of an inert-tracer gas 29. First, differences in convective gas transport resulting from differences in specific ventilation between relatively large lung units, which are filled and emptied sequentially, give rise to a phase-III slope. This component of the phase-III slope is independent of the diffusivity of the gas molecule studied and occurs at branch points separating units larger than acini or small groups of acini. Secondly, interaction between convective and diffusive gas mixing due to geometrical asymmetries at branch points in the region where the steepest part of the quasi-stationary diffusion front for the gas molecule is positioned, contributes to the expiratory phase-III slope 20. For the more diffusible (He) molecule this process is estimated to occur around the entrance to the acinus, whilst for the less diffusible (SF6) molecule it is predicted to occur 2–3 airway generations more distally within the acinus 30. The phase-III slope is greater for SF6 than for He, due in part to the greater geometrical asymmetry of airway branching more distally in the normal human acinus 28. Airway conditions causing increased geometrical asymmetries in the peripheral lung are predicted to result in a greater phase-III slope, particularly forthe inert tracer with the steepest part of the diffusion-convection front at the lung depth where airway pathology has occurred 30. In the present study the authors aimed to see if CACh-induced airway obstruction in asthmatic subjects is associated with a greater increase in the phase slopes for either He orSF6. A greater phase-III slope for He than for SF6 after CACh would indicate greater involvement of bronchioli located in the vicinity of the acinar entrance than more peripherally located bronchioli, whilst a greater increase of the SF6 phase-III slope would suggest a greater airway reaction deeper in the lung. Participants included 55 adults (28 males, mean age 34.9 yrs) (table 1⇓) with childhood asthma, who took part in an asthma follow-up study 22–24. Forty-three subjects reported asthma symptoms over the last year, 17 had persistent asthma symptoms or medicated regularly, and nine took asthma medication continuously 24. Eight subjects used inhaled corticosteroids and four reported additional regular use of inhaled long-acting β2-agonists, but none were on regular systemic steroid therapy. The study was approved by the local research ethics committee. Subjects were investigated out of pollen season, when free from airway infections, and asthma medication was withheld for 24 h prior to testing. Forced expiratory manoeuvres were performed in triplicate at rest, in duplicates at 2, 5and 15 min after bronchoprovocation, and in triplicates 10 min after inhalation of nebulised salbutamol, using a Jaeger Masterscreen body plethysmograph (Erich Jaeger AG, Würzburg, Germany). The best FEV1 obtained on each occasion was used when determining the maximum fall in FEV1 after CACh. A He and SF6 SBW (He/SF6 SBW) test was performed in triplicate at rest, 7–12 min after CACh and 15 min after β2-agonist therapy. Equipment for the He/SF6 SBW test consisted of a mouthpiece attached to a heated Fleisch No.1 pneumotachometer (PNT; Metabo SA, Epalinges, Switzerland). The PNT was connected to a Hans Rudolph (Kansas City, MS, USA) three-way directional valve, allowing the subjects to breath room air or a test gas mixture consisting of 4% He, 4% SF6, 22% oxygen (O2) and 70% N2 via a demand valve. Gas concentrations were sampled at the mouth using an AMIS 2000 mass spectrometer (Innovision A/S, Odense, Denmark). When performing the test the directional valve was switched at FRC level, 1 L of the gas mixture was inhaled and the subjects then exhaled to residual volume (RV) at a target flow of 0.4 L·s−1. Feedback on volumes and flows was provided from a computer screen placed in front of the subjects. Gas concentration was plotted against expired volume. The SIII (slope of phase III; alveolar plateau slope) for He and SF6 and for the slope difference between SF6 and He were computed between 35 and 85% of expired volume. The (SF6-He) slope difference was calculated sample by sample. The slopes were normalised by the average gas concentration over this volume resulting in normalised phase-III slopes (SnIII), to account for the small difference in concentration of the inhaled tracer gases, and for dilution differences due to the differences in lung size among the subjects. The negative He and SF6 slopes (decreasing gas concentration with expired volume) were treated as positive and therefore a greater SnIII indicates greater inhomogeneity. CACh was carried out by 4 min of isocapnic hyperventilation of cold (−15°C) dry air at 75% of the predicted maximum voluntary ventilation (approximated as 35×subject's baseline FEV1) using a Jaeger Respiratory Heat Exchange System (RHES; Erich Jaeger AG). The maximum relative fall in FEV1 after CACh was calculated. The participants were separated into three groups with respect to their maximum fall in FEV1 after CACh. A fall in FEV1 of <10% was regarded as a nonsignificant overall airway response. A reduction of 10–19% was regarded a minor reaction and a fall in FEV1 of ≥20% was considered a major response. One-way analysis of variance (ANOVA) was used to assess differences in lung function parameters between defined groups or between different situations within the same group of subjects. When the ANOVA resulted in a significant overall difference, further post hoc comparisons were undertaken using the Tukey honest significant difference (HSD) test. Pearson linear correlation analysis between FEV1 and phase-III slopes were performed in the group as a whole and separately for subgroups, and the findings are presented as r2 and resulting p-values. p-Values <0.05 were regarded as statistically significant. Demographical data and baseline spirometry findings for the study population are given in table 1⇑. The participants were separated into three subgroups with respect to their maximum fall in FEV1 after CACh. 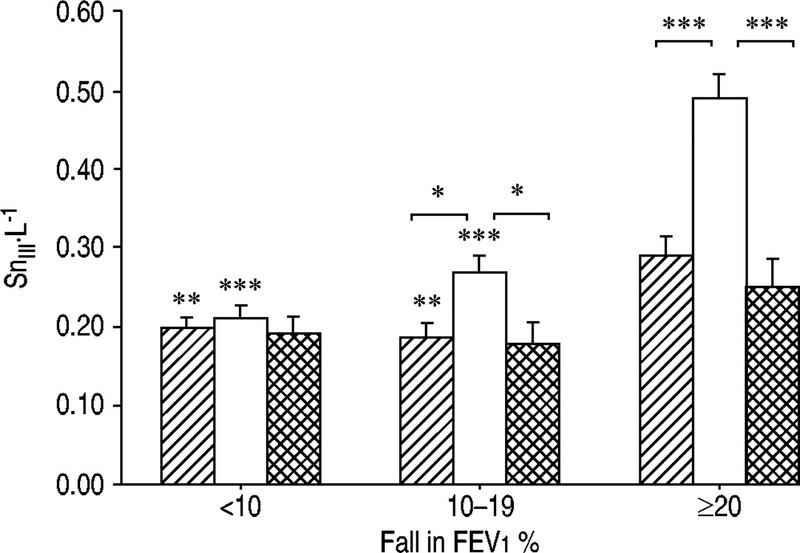 The subgroup with a fall in FEV1 of <10% (n=27) was termed nonresponders, those with a minor fall in FEV1 (10–19%; n=16) were called minor responders, while the group with a major fall in FEV1 (≥20%; n=12) was termed major responders. In the resting situation or after bronchodilator treatment, per cent predicted FEV1 did not differ significantly between the three subgroups, but as a result of the selection, large and statistically significant differences in average per cent fall in FEV1 after CACh were seen between the groups (table 2⇓). At rest, the He and SF6 SnIII were both significantly greater among the major responders than among the nonresponders (p=0.001 and p=0.006, respectively) or the minor responders (p=0.001 and p=0.006, respectively) (figs 1 and 2⇓⇓). However, there were no significant differences in the (SF6-He) SnIII between the three groups at rest (fig. 3⇓).
) in subjects with a fall in forced expiratory volume in one second (FEV1) <10% after CACh (nonresponders; n=27), in subjects with a fall of 10–19% (minor responders; n=16) and in those with a fall in FEV1 of ≥20% (major responders; n=12). Data are presented as mean±sem. The brackets indicate statistical comparisons were made within each group. Where no lines are given the symbols indicate comparisons with the major responders for the corresponding situation. *: p<0.05; **: p<0.01; ***: p<0.001.
) in subjects with a fallin forced expiratory volume in one second (FEV1) <10% after CACh (nonresponders; n=27), in subjects with a fall of 10–19% (minor responders; n=16) and in those with a fall in FEV1 of ≥20% (major responders; n=12). Data are presented as mean±sem. The brackets indicate statistical comparisons were made within each group. Where no lines are given the symbols indicate comparisons with the major responders for the corresponding situation. *: p<0.05; **: p<0.01; ***: p<0.001.
) 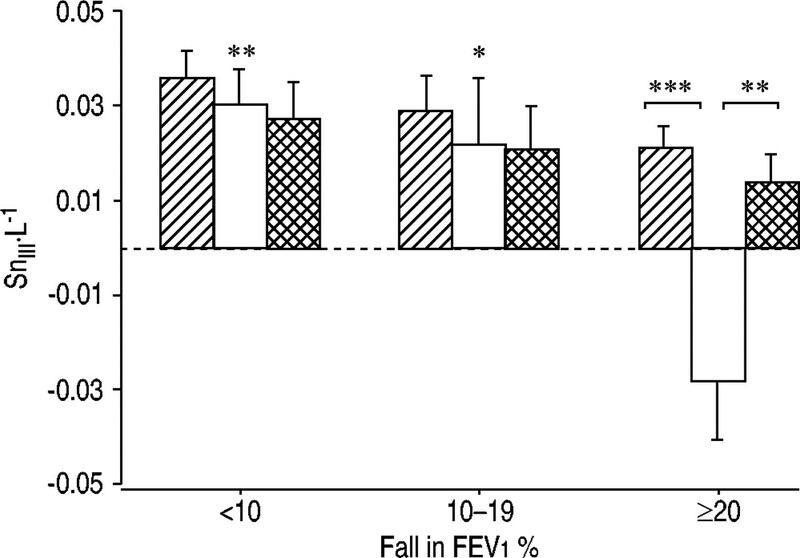 in subjects with a fall in the forced expiratory volume in one second (FEV1) <10% after CACh (nonresponders; n=27), in subjects with a fall of 10–19% (minor responders; n=16) and in those with a fall in FEV1 of ≥20% (major responders; n=12). Data are presented as mean±sem. The brackets indicate statistical comparisons were made within each group. Where no lines are given the symbols indicate comparisons with the major responders for the corresponding situation. *: p<0.05; **: p<0.01; ***: p<0.001. Among the nonresponders the SnIII for He, SF6 or (SF6-He) did not change significantly after CACh or β2-agonist treatment (figs. 1–3⇑⇑⇑). Among the minor responders the He and the SF6 SnIII both increased significantly after CACh (p=0.014 and p=0.043, respectively) (figs 1 and 2⇑⇑). After β2-agonist therapy the He and the SF6 SnIII both declined again (p=0.015 and p=0.014) (figs 1 and 2⇑⇑). However, the (SF6-He) SnIII difference did not change with CACh or bronchodilator therapy among the minor responders (fig. 3⇑). Among the major responders the He and SF6 SnIII both increased markedly after CACh (p<0.001) and subsequently declined significantly after β2-agonist therapy (p<0.001) (figs 1 and 2⇑⇑). As a result of a greater increase in He than SF6 SnIII after CACh, the average (SF6-He) SnIII difference declined to a large extent and became negative after CACh (p<0.001), but was restored after bronchodilator treatment (p=0.004) (fig. 3⇑). When comparing the subgroups, the He and SF6 SnIII both became markedly greater in the major responder group after CACh than in the two other groups (figs 1 and 2⇑⇑; p<0.001). In addition, the (SF6-He) SnIII became significantly lower among the major responders than among the nonresponders (p=0.001) or the minor responders (p=0.016) after challenge (fig. 3⇑). After bronchodilator therapy none of the ventilation distribution parameters (SnIII for He or SF6, or the (SF6-He) SnIII difference) differed significantly between the groups. Table 3⇓ gives the Pearson correlation coefficients and resulting p-values for FEV1 and phase-III slopes in the different conditions. For the study group as a whole and for the subgroup of major responders, significant correlations were found between the FEV1 % predicted and the SF6, He and (SF6-He) normalised phase-III slopes after CACh. In the major responder group there were also significant correlations between the FEV1 % pred and the SF6 and He normalised phase-III slopes measured after bronchodilator therapy. For the study group as a whole the change in FEV1 % pred from baseline to post-CACh correlated significantly with the corresponding changes in the SF6 and He normalised phase-III slopes and with the change in the (SF6-He) normalised phase-III slope difference. Also, among the major responders and the minor responders separately, significant correlations were found between the change in FEV1 % pred from baseline to post-CACh and the change in the (SF6-He) normalised phase-III slope difference. For the study group as a whole, weak but statistically significant positive correlations were found between the relative fall in FEV1 after CACh and the baseline normalised phase-III slopes for SF6 (r2=0.16; p=0.002) and for He (r2=0.21; p<0.001). There was also a weak association between the fall in FEV1 and the baseline FEV1 % pred (r2=0.12; p=0.011), indicating greater BHR in those with a low resting FEV1. In this study the asthmatic subjects who reacted to CACh with a major fall in FEV1 also displayed large increments inthe He and SF6 phase-III slopes obtained from SBW tests. Of particular interest is the finding that the He phase-III slopeincreased more than the SF6 slope after CACh in the subgroup with the most severe AHR. This finding indicates that peripheral airways located close to the He diffusion-convection front, which is estimated to be situated in the region of the entrance to the acinus 30, participate in theoverall airway reaction to CACh. Correlation analysis demonstrated statistically significant, although not very strong associations between the FEV1 and the phase-III slope responses after airway challenge. In particular, the association between FEV1 and the (SF6-He) slope difference indicates that the peripheral airways contribute to the overall airway reaction after CACh. Compared to the remaining participants, the subjects who reacted to CACh with a major fall in FEV1 showed greater He and SF6 phase-III slopes in the resting situation but similar (SF6-He) slope difference and similar FEV1. While the similar (SF6-He) difference in major responders with respect to non- and minor responders in theresting condition precludes a definite conclusion about baseline intra-acinar dysfunction in these patients, the greater He and SF6 phase-III slopes do suggest that the degree of AHR may at least be partly related to baseline peripheral airways dysfunction in asthma. The findings in this study are in accordance with previously reported evidence that asthma involves the peripheral airways 5–13 and support the emerging view that inflammation, structural changes and functional abnormalities in the peripheral airways are important for asthma severity 1–3. Nevertheless, Verbanck et al. 12 have recently pointed out that in mild asthma acinar contribution to ventilatory inhomogeneity may be limited and, in fact, fully reversible after β2-agonist treatment, whereas small but conductive airways show a distinct abnormality persisting after bronchodilation. These data can be made to agree with the present results of increased He and SF6 phase-III slopes without a significant change in (SF6-He) slope difference. Forced expiratory volumes and flows are the most commonly used methods for assessing lung function and airway response to provocations in asthmatic subjects, but the results of these measurements are believed to be dominated by large airway function 32. As the total cross-sectional area of the airways increases with increasing airway generation, it can be predicted that peripheral airway resistance will contribute little to total lung resistance. Indeed, using a retrograde catheter technique, it has been demonstrated that the small airways are low resistance pathways, contributing <10% of the total resistance to airflow in the lung 33. It is therefore necessary to employ techniques other than forced expiration to measure peripheral airway function. In the present study a technique similar to that used previously by Estenne et al. 34 and Van Muylem et al. 35 in studies on subjects with cystic fibrosis (CF) lung disease 20 and post-lung transplant obliterative bronchiolitis was employed. Following the inhalation of 1 L of an insoluble inert-tracer gas mixture from FRC, the subject was required to exhale slowly to RV, and the concentration of the exhaled tracer gas was plotted against exhaled volume. The slope of the phase III (also known as the alveolar plateau) derived from this plot is the result of incomplete gas mixing in the lungs and is used as a measure of the inhomogeneity of ventilation distribution. Convection and diffusion and their interaction are the processes responsible for the mixing of the fresh inspired air with the resident gas in the lungs. At branch points located proximal to the gas-exchange zone, convection is by far the most important mechanism of gas mixing. Convection-dependent ventilation inhomogeneity results from differences in specific ventilation and sequential filling and emptying between lung units subtended by branch points located mouthward of the diffusion-convection front for a gas molecule, and affects tracer gases with different diffusivity equally, producing similar phase-III slopes for tracer gases such as He and SF6. Towards the periphery of the airway tree the linear velocity of the inspired air decreases dramatically and the gas molecules will reach a lung zone where convective and diffusive mixing processes affect them equally. The zone where this occurs marks the location of the quasi-stationary inspiratory diffusion-convection front. Because He is approximately six-times more diffusive than SF6 the diffusion-convection front for He is predicted to arise more proximally for this molecule, in the vicinity of the entrance to the acinus, whilst for SF6 it is estimated to occur two to three airway generations more deeply in the acinus 29. In the vicinity of the diffusion-convection front of a gas molecule, interaction occurs between diffusive and convective mixing processes resulting in a steeper expiratory phase-III slope for the gas species concerned 29. In contrast, ventilation inhomogeneities due to airway obstruction mouthward of the diffusion-convection front contribute similarly to the convection-related component of the phase-III slopes for He and SF6. Geometrical asymmetries due to obstruction in the vicinity of the entrance to the acinus will increase the diffusion-convection interaction-related increase of the phase-III slope more for He than for SF6, whilst obstruction deeper within the acinus is predicted to increase the phase-III slope more for SF6 30. By calculating the difference in phase-III slopes for the two gases, i.e. the (SF6-He) phase-III slope difference, the site of predominant peripheral airway obstruction may be indicated. If, however, the changes in He and SF6 phase-III slopes are identical, it cannot be established whether a reaction has occurred in the distal airways or if the airway reaction has taken place more proximally and the slope changes are due to convection-dependent mechanisms. The use of inspiration of 1 L from FRC instead of a VC breath starting from RV has been shown to maximise the contribution of the diffusion-convection mechanism, with respect to the purely convection-dependent contribution to the phase-III slope. Indeed, this manoeuvre roughly corresponds to the firstbreath of an MBW test, which has been shown to be dominated by acinar ventilation inhomogeneity 11. In normal subjects, the increasing geometric asymmetry in the lung periphery results in a greater phase-III slope for SF6 than for He 28. Van Muylem and Baron 20 have previously shown that the phase-III slope for He is greater than the SF6 slope early in the course of CF lung disease, whilst the SF6 slope is greater in CF subjects with advanced disease, findings compatible with histopathological evidence of membranous bronchiole involvement early in the course of CF 36. Moreover, a greater He than SF6 phase-III slope at rest or after methacholine challenge appears to be an early finding of peripheral airway pathology also in lung-transplant subjects developing obliterative bronchiolitis 34, a condition known to occur preferentially in bronchioli located mouthward of the terminal bronchioles 34. These previously reported data support the view that a greater He than SF6 phase-III slope is an indicator of pathological processes in bronchioli located close to the entrance of the acini. The authors have been able to identify only one previous study using the He/SF6 SBW technique to assess peripheral airway involvement in asthma. In a study by Peces-Barba etal. 21, 13 asthma patients and 30 controls performed spirometry and an SBW test, using 5% He, 5% SF6 and 10% Argon in the tracer gas mixture, before and after bronchodilator therapy. A good correlation was reported between the baseline FEV1 and the phase-III slopes for the tracer gases (r=−0.8) in the asthma patients and there was a similar correlation between the FEV1 and the SBW responses to bronchodilator treatment. Interestingly, a significant correlation was also found between the baseline FEV1 and the (SF6-He) slope difference (r=0.59). Five of the 13 asthma patients demonstrated a negative (SF6-He) slope difference. After bronchodilation the (SF6-He) slope difference became close to zero in three and positive in two of these five patients. 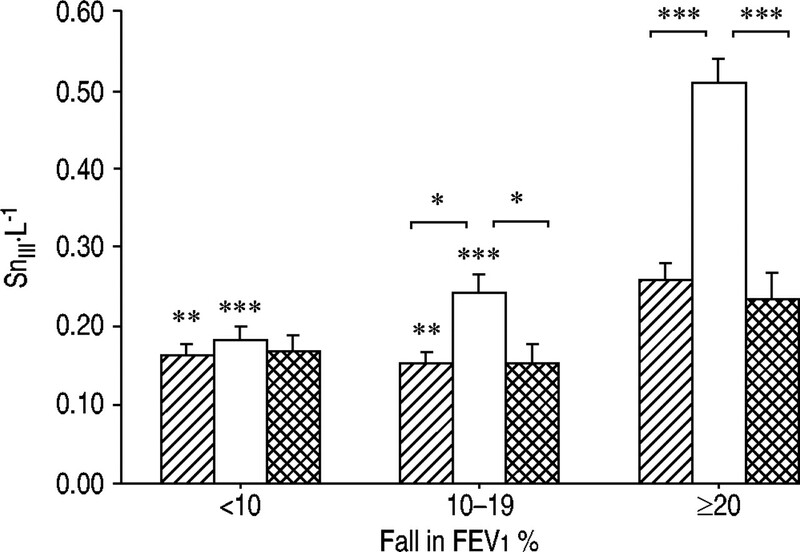 The authors interpreted the close association between FEV1 and the magnitude of the phase-III slopes as evidence of concomitant central and peripheral airway obstruction in these asthma patients. They further concluded that the negative (SF6-He) slope difference must be caused by marked inhomogeneity ofventilation distribution occurring between the respective diffusion-convection fronts for the two gases, and that bronchodilator therapy is effective even in these very peripheral airways. The findings in the present study differ in some respects from those reported by Peces-Barba et al. 21. In contrast to their study, no correlation between baseline FEV1 % pred and phase-III slopes for either tracer gas or for the slope difference was found in the present study. After CACh, however, significant correlations between FEV1 % pred and phase-III slopes for the group as a whole as well as for the major and minor responder groups separately were found, suggesting that the present study population may have had a better resting lung function. There were also significant correlations between the induced fall in FEV1 % pred and the change in the phase-III slopes for SF6, He and the (SF6-He) slope difference for the present study group as a whole. In addition, the minor and major responder groups both demonstrated significant correlations between the induced fall in FEV1 % pred and the change in the (SF6-He) slope difference. These findings are in agreement with the significant correlation between the bronchodilator response of FEV1 and phase-III slopes in the study by Peces-Barba et al. 21, indicating that the most peripheral airways of asthmatic subjects are reactive to both constrictor and dilator stimuli. Measurements of peripheral airway mechanics have also been used to assess peripheral airway obstruction and hyperresponsiveness in asthma patients 8–10. Wagner et al. 8 wedged a bronchoscope in a distal lung unit in mild asthmatic subjects who had normal spirometry findings, and found that baseline peripheral airway resistance was increased up to seven-fold when compared with normal subjects. Furthermore, a positive correlation was found between the magnitude of the baseline peripheral airway resistance and the degree of sensitivity to methacholine in the asthmatic subjects. With a similar technique, Kaminsky et al. 9 demonstrated that peripheral airway resistance rises more in asthmatics than in normal subjects after segmental challenge with cool, dry air, indicating that the peripheral airways are hyperresponsive inasthma, possibly due to the ongoing inflammation in the lung periphery previously demonstrated in hyperresponsive asthma patients 7. Kaminsky et al. 9 also reported that baseline peripheral airway resistance correlated significantly with the degree of EIB in the asthma patients. The findings inthe Wagner et al. 8 and Kaminsky et al. 9 studies not only demonstrate that mildly asthmatic subjects may have considerable peripheral airway dysfunction in the presence of normal spirometric values, but also provide evidence that peripheral airway dysfunction at rest is associated with the severity of overall BHR. The findings of the current study also support this in that steeper phase-III slopes were found at rest in the subgroup with the most marked BHR compared to the other subgroups despite similar FEV1 % pred, and there were statistically significant associations between baseline phase-III slopes and the FEV1 response to CACh. Interestingly, previous computational analyses based on quantitative histology have shown that the peripheral airways may indeed account for most of the AHR in asthmatic subjects 37. Airway obstruction occurring after dry cold-air challenge is thought to be produced by bronchoconstricting agents released by inflammatory cells in the airways, which degranulate secondary to the hyperosmolar stimulus 17. Anti-inflammatory therapy with inhaled corticosteroids has been shown to have an excellent effect on EIB 38 and also on the airway response to hyperosmolar challenge by hypertonic saline 18, supporting the view that hyperresponsiveness to CACh is related to inflammation in the affected airways. The findings in the present study thus provide further physiological evidence of the importance of peripheral airway inflammation in asthma previously demonstrated using histopathology methods 5–7. In asthmatic subjects who demonstrate a major overall airway response to dry cold-air challenge, obstruction also occurs in the peripheral airways. This response extends at least into bronchioli located in the proximal portion of the acini. In addition, there is greater, partly peripheral, airway dysfunction at rest in asthmatic patients with pronounced airway hyperresponsiveness to dry cold-air challenge. This study has provided further physiological evidence that asthma involves airways within or close to the gas exchange zone andthe findings support the view that inflammation and dysfunction in the peripheral airways are important for overall airway hyperresponsiveness in asthma and indirectly for asthma severity. The authors would like to thank S. Källman for skilful technical assistance. Howarth PH. Small airways and asthma. An important therapeutic target?. Am J Respir Crit Care Med 1998;157:S173–S207. Green M. Treating large and small airways. Int J Clin Pract Suppl 1998;96:2–4. Bjermer L. History and future perspectives of treating asthma as a systemic and small airways disease. Respir Med 2001;95:703–719. Weibel ER.. Morphometry of the Human LungNew York, Academic Press, 1963. Carroll N, Elliot J, Morton A, James A. The structure oflarge and small airways in nonfatal and fatal asthma. Am Rev Respir Dis 1993;147:405–410. Saetta M, Di Stefano A, Rosina C, Thiene G, Fabbri LM. Quantitative structural analysis of peripheral airways and arteries in sudden fatal asthma. Am Rev Respir Dis 1991;143:138–143. Kraft M, Djukanovic R, Wilson S, Holgate ST, Martin RJ. Alveolar tissue inflammation in asthma. Am J Respir Crit Care Med 1996;154:1505–1510. Wagner EM, Liu MC, Weinmann GG, Permutt S, Bleecker ER. Peripheral lung resistance in normal and asthmatic subjects. Am Rev Respir Dis 1990;141:584–588. Kaminsky D, Irvin C, Gurka D, et al. Peripheral airway responsiveness to cool, dry air in normal and asthmatic individuals. Am J Respir Crit Care Med 1995;152:1784–1790. Kaminsky D, Bates J, Irvin C. Effects of cool, dry air stimulation on peripheral lung mechanics in asthma. Am J Respir Crit Care Med 2000;162:179–186. Verbanck S, Schuermans D, Noppen M, Van Muylem A, Paiva M, Vincken W. Evidence of acinar airway involvement in asthma. Am J Respir Crit Care Med 1999;159:1545–1550. Verbanck S, Schuermans D, Paiva M, Vincken W. Non-reversible conductive airways ventilation heterogenity in mild asthma. J Appl Physiol 2003;94:1380. Stromberg NOT, Gustafsson PM. Ventilation inhomogeneity assessed by nitrogen washout and ventilation-perfusion mismatch by capnography in stable and induced airway obstruction. Pediatr Pulmonol 2000;29:94–102. Macklem PT. The physiology of the small airways. Am J Respir Crit Care Med 1998;157:S181–S183. Milgrom H, Taussig LM. Keeping children with exercise-induced asthma active. Pediatrics 1999;104:e38. Lee TH, Anderson SD. Heterogeneity of mechanisms in exercise induced asthma. Thorax 1985;40:481–487. Anderson SD. Challenge tests to assess airway hyperresponsiveness and efficacy of drugs used in the treatment of asthma. J Aerosol Med 1996;9:95–109. du Toit JI, Anderson SD, Jenkins CR, Woolcock AJ, Rodwell LT. Airway responsiveness in asthma: bronchial challenge with histamine and 4.5% sodium chloride before and after budesonide. Allergy Asthma Proc 1997;18:7–14. Riedler J. Nonpharmacological challenges in the assessment of bronchial responsiveness. Eur Respir Mon 1997;5:115–135. Van Muylem A, Baran D. Overall and peripheral inhomogeneity of ventilation in patients with stable cystic fibrosis. Pediatr Pulmonol 2000;30:3–9. Peces-Barba G, Cabanillas JJ, Rubio ML, Vallejo J, González Mangado N. Eur Respir J 1991;4:Suppl. 14, 576s. Kjellman B, Gustafsson PM. Asthma severity, allergy and lung function during middle life in subjects with asthma in childhood. Respir Med 2002;96:716–724. Kjellman B, Gustafsson PM. Asthma from childhood to adulthood: asthma severity, allergies, sensitization, living conditions, gender influence and social consequences. Respir Med 2000;94:454–465. Gustafsson PM, Kjellman B. Asthma from childhood to adulthood: course and outcome of lung function. Respir Med 2000;94:466–474. Buist SA, Ross BB. Quantitative analysis of the alveolar plateau in the diagnosis of early airway obstruction. Am Rev Respir Dis 1973;108:1078–1087. Guy HJ, Prisk GK, Elliott AR, Deutschman RA 3rd, West JB. Inhomogeneity of pulmonary ventilation during sustained microgravity as determined by single-breath washouts. J Appl Physiol 1994;76:1719–1729. Dutrieue B, Lauzon AM, Verbanck S, et al. Helium and sulfur hexafluoride bolus washin in short-term microgravity. J Appl Physiol 1999;86:1594–1602. Prisk G, Elliot AR, Guy HJB, Verbanck S, Paiva M, West JB. Multiple-breath washin of helium and sulfur hexafluoride in sustained microgravity. J Appl Physiol 1994;84:244–252. Paiva M, Engel LA.. Gas mixing in the lung peripheryIn: Chang HK, Paiva M, editors. Respiratory Physiology. An analytical approach. Vol. 40New York, Marcel Dekker, 1989; pp. 245–276. Dutrieue B, Vanholsbeeck F, Verbanck S, Paiva M. A human acinar structure for simulation of realistic alveolar plateau slopes. J Appl Physiol 2000;89:1859–1867. Gustafsson PM, Eiken O, Grönkvist MJ. Effects of hypergravity and anti-G-suit pressure on intraregional ventilation distribution during VC breaths. J Appl Physiol 2001;91:637–644. Hogg JC, Macklem PT, Thurlbeck WM. Site and nature of airway obstruction in chronic lung disease. N Engl J Med 1968;278:1355–1360. Macklem PT, Mead J. Resistance of central and peripheral airways measured by a retrograde catheter. J Appl Physiol 1967;22:395–401. Estenne M, Van Muylem A, Knoop C, Antoine M. Detection of obliterative bronchiolitis after lung transplantation by indexes of ventilation distribution. Am J Respir Crit Care Med 2000;162:1047–1051. Van Muylem A, Paiva M, Estenne M. Involvement of peripheral airways during methacholine-induced bronchoconstriction after lung transplantation. Am J Respir Crit Care Med 2001;164:1200–1203. Baltimore RS, Christie CD, Smith GJ. Immunohistopathologic localization of Pseudomonas aeruginosa in lungs from patients with cystic fibrosis. Implications for the pathogenesis of progressive lung deterioration. Am Rev Respir Dis 1989;140:1650–1661. Kuwano K, Bosken CH, Pare PD, Bai TR, Wiggs BR, Hogg JC. Small airways dimensions in asthma and in chronic obstructive pulmonary disease. Am Rev Respir Dis 1993;148:1220–1225. Henriksen JM, Dahl R. Effects of inhaled budesonide alone and in combination with low-dose terbutaline in children with exercise-induced asthma. Am Rev Respir Dis 1983;128:993–997. Pedersen S, Hansen OR. Budesonide treatment of moderate and severe asthma in children: a dose-response study. J Allergy Clin Immunol 1995;95:29–33.